If you're watching a workshop, or listening to an audiobook, you will probably want the next chapter to automatically start playing for you after the chapter you're listening to finishes. 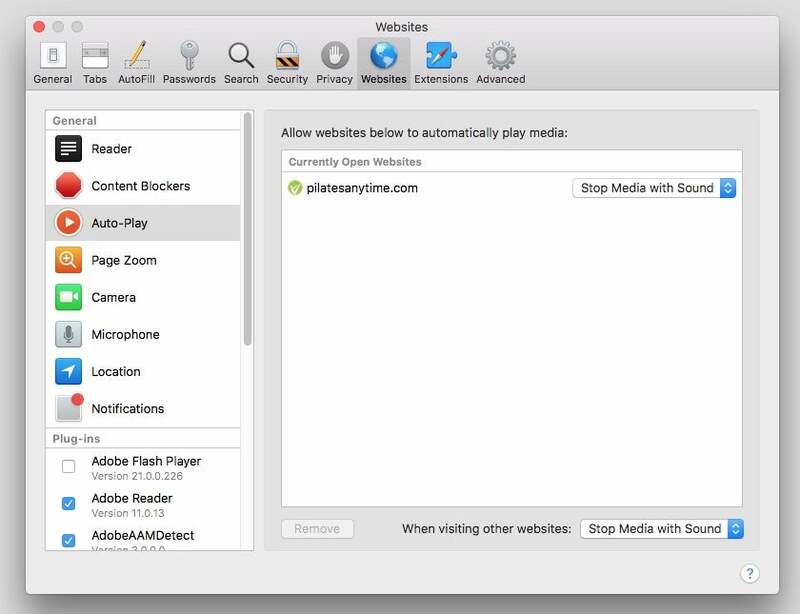 Unfortunately, the Safari browser now blocks this functionality by default. You could use a different web browser to solve this problem, or you can change your Safari preferences to fix it. Make sure you are on the Pilates Anytime website. Click on Safari > Preferences on the top menu. Click on the Websites tab at the top. Click on Auto-Play in the left column. We're glad we were able to answer your question! If you have any feedback for us on how we can improve this answer, or a suggestion for a new FAQ please Contact Us. You need to be a subscriber to post a comment. Please Log In or Create an Account to start your free trial. How do I change the volume of a video? How do I stay logged into the site? What can I do if the video isn't playing correctly? Do I need Flash to watch videos? How do I fast-forward or rewind a video?